NextA rare Byzantine Egyptian streetscape on show in Kiryat Gat, Israel. The rise of the Achaemenid or Persian Empire in the sixth century BC was swift, arguably due to the endeavours of Persia’s first influential king, Cyrus The Great. Although, the Achaemenid empire’s power never truly extended west beyond the fringes of the Balkans, its glorious reign over two centuries, nonetheless left a remarkable legacy on the people’s and cultures of Babylon, Egypt, Greece and Persia. When Cyrus II succeeded his father Cambyses I to the throne, he was under no illusions that his reign was conditional or subject to the authority of the Medes. However, in the year 553 BC, he began a war with his overlord King Astyages of the Medes and by 550 BC he had seized the Median capital of Ecbatana. The conquest of Media was simply the start of his wars and in a period of twenty years, he conquered a vast empire in his own right, worthy of any great king before him. His success as a ruler was achieved on the backbone of a large field army and cavalry. His war machine was expected to be ready at all times, in peace and at times of war. The core of Cyrus’ army was made of ‘Iranians’, then Medians and later subject people who were conquered and incorporated into the empire. Successive Achaemenid kings improved the standing of their great armies. Darius I, in particular, expanded and made significant changes to the army in the years after the death of Cyrus II. He saw the need for an entire overhaul of the infantry, in particular the cavalry. (Darius I is also credited as the first Achaemenid king to invest in a Persian ‘imperial navy’ fleet.) The result was the feared Persian professional army, the’ Spada’, which consisted of a very large infantry, cavalry and the charioteers. 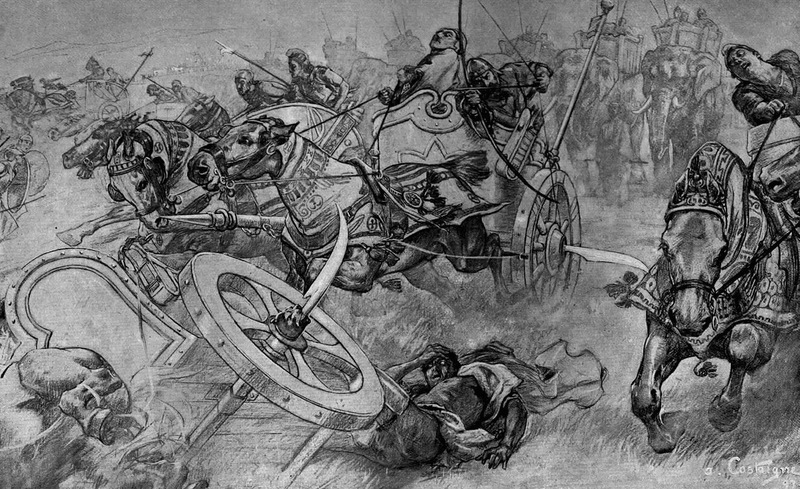 The charge of the Persian scythe chariots at the Battle of Gaugamela. Drawing by A. Castaigne (1898-99). With the evolution of chariot warfare to larger numbers of mounted warriors or cavalry, the chariot had in effect become almost obsolete. Persian nobility general used it as a symbol of status and power. Though to the Persians credit, they revamped it as a scythed chariot. Long mounted curved blades were attached to the wheels of chariots, with the idea being that they could cut down everything in its path. Designed primarily as an offensive weapon, it was somewhat effective and used to carve up tightly formed phalanx formations. The cavalry horseman would usually follow close behind these scythed chariots, to strike at the enemy once they had scattered. In battle, Persian archers were also used to aid the cavalryman, by firing a hail of arrows at the enemy, while the horseman rode around the perimeter of pitched battles, throwing enemy lines into disarray. The cavalry horseman was roughly equipped the same as the Persian infantry soldier. However, the horseman carried two spears, one for throwing at his enemy and usually another for defending himself. Some wore helmets and padded linen corselets, but most did not have armour during the wars in its early history. Darius I changed all of that after his failure at the Battle of Marathon. The introduction of the heavy armoured cavalry known as a Cataphract, gave rise to the Achaemenid scale armoured horseman. 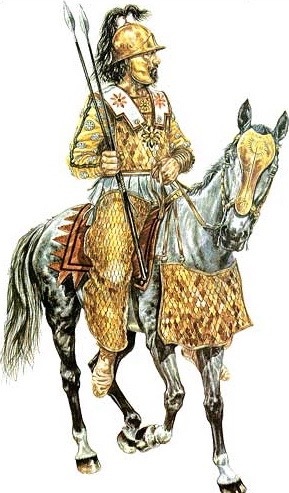 Though, it is important to note that the Achaemenids, unlike their later Persian successors, the Parthians and Sassanids, did not use the ‘heavy cavalryman’ as a principal striking force. The cavalry had been crucial in all of the Achaemenid wars, in conquering the vast lands beyond Persia from Greece to India, and it retained its importance to the very last days of the Achaemenid empire. Interestingly, from India, it is believed that Darius I first brought back war elephants to use in battle. ( As part of the Achaemenid cavalry, camel-borne units were also introduced.) An untrained horse was quite fearful of the war elephant and often most cavalry units were wholly useless against them. Getting back on topic, the Achaemenids or Persians hold an important place in our story of the war-horse, but they too as a civilisation had problems in maintaining their dominance and power. There are many reasons why their empire fell, some of the most obvious being military. All along the Achaemenids northern frontier lived the Scythians, whose culture was based on the horse. These Scythians were known for their repeated harassed of Achaemenid settlements. The Scythians were only one of a few groups of people who the Achaemenids couldn’t defeat. The other more famous nation that the Achaemenids couldn’t defeat and which eventually led to their downfall were the Macedonians. Under Alexander the Great, the Achaemenids would be ultimately destroyed, not only because of Alexander’s amazing and daring skill as a commander, but because of his more manoeuvrable cavalry. The header image is a painting of Cyrus The Great. A rare Byzantine Egyptian streetscape on show in Kiryat Gat, Israel. Brothers in power, migration and pending disaster!